The Indo-Pacific warm pool - pictured above in bright orange -- has warmed by 1 degree Fahrenheit, or .5 degree Celsius, over the past 50 years, mostly due to human-generated greenhouse gas emissions. 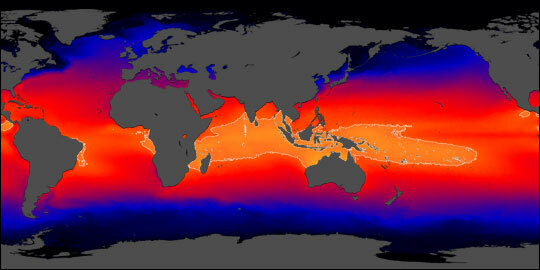 These temperature changes are driving changes in sea level patterns.Image via NASA Earth Observatory. This season, we’ve been following Mumbai through the monsoon, looking at how monsoon season can ravage transportation systems and batter infrastructure, putting people’s lives and livelihoods in jeopardy. Now, a new study in Nature Geoscience describes how climate change from greenhouse gas (GHG) emissions is leading to dangerous sea level rises — particularly in the Arabian Sea, the Indian Ocean, and the Bay of Bengal — and potentially heavier monsoon rains, which will aggravate flooding in places like Mumbai. More specifically, temperature changes in the Indo-Pacific warm pool — a massive, bathtub-shaped expanse stretching from the east coast of Africa to the International Date Line in the Pacific — are driving the sea level rise. The pool holds the warmest seawater in the world, and has heated by 1 degree Fahrenheit, or .5 degree Celsius, over the past 50 years, mostly due to GHG emissions. These emissions are causing changes in two crucial atmospheric wind patterns — the Hadley circulation and the Walker circulation — which determine sea level patterns in the region. Changes in these wind patterns are generating sea level rises significantly higher than the global average along the coastal lines of the Arabian Sea, the Indian Ocean, and the Bay of Bengal, along with islands like Sumatra, Sri Lanka and Java. In the meantime, these changes are causing the sea level to fall in other places, for instance, the Seychelles Islands and the island of Zanzibar. A Times of India cartoon makes light of transit troubles during the monsoon with this picture of a "monsoon-proof bike." However, serious attention to monsoon preparedness is essential for affected cities' transit systems. Image via Times of India. And lead author Weiqing Han says changes in circulation patterns could also affect precipitation, leading to heavier monsoons in the eastern tropical regions of the Indian Ocean, and dangerous droughts in the western equatorial Indian Ocean region. This is particularly relevant in low-lying coastal areas like Mumbai, which will be affected by both rising tides and increased rains. Better coordination and streamlining of government agencies responsible for urban infrastructure. Enforcing bans on plastic bags. As one of our Mumbaiker readers commented, enforcing bans on plastic bags — on the books but rarely enforced in places like Mumbai — would signify a huge improvement in urban monsoon preparedness, since the bags clog drains and exacerbate flooding. Enjoy the Ride on Earth Day!